Professor Jessica Lundquist shows students how to see layers of a snow pit using a thermal infrared camera. Snow school is cool on many levels. In January, CEE students attended a snow measurement field school where they learned about fundamental concepts and practices of snow hydrology. About 25 students from around the world, including China and Nepal, gathered for the three-day snow school, sponsored by the Consortium of Universities for the Advancement of Hydrologic Science, with funding from NSF and NASA. 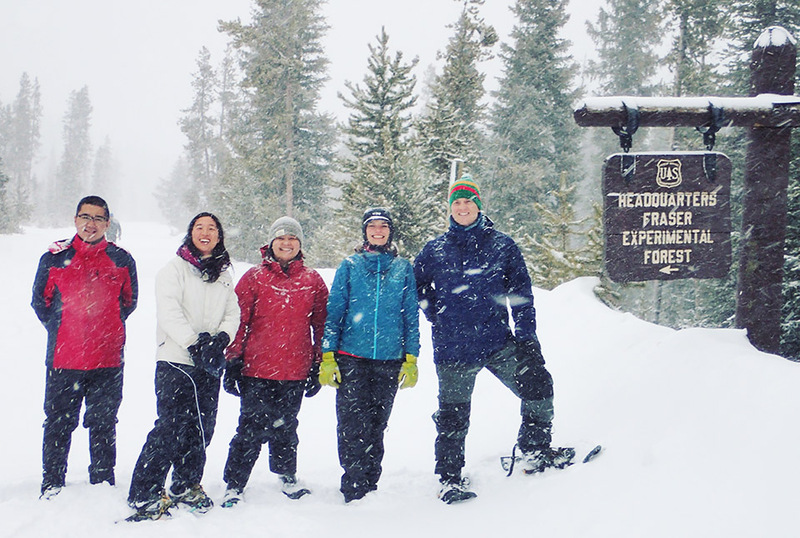 Snow school was held at Fraser Experimental Forest in the Colorado Rocky Mountains. Attending from UW CEE were professor Jessica Lundquist, graduate students Victoria Ly, Steven Pestana and William Ryan Currier (who was the TA), undergraduate Dylan Reynolds and Valle Scholar Andri Gunnarsson. CEE graduate student Victoria Ly (second from left) and students from Utah, North Carolina, and China are all smiles in a fresh snow storm. Snow hydrology focuses on measuring and analyzing the movement of snow and ice, which are important predictors of water melt that supplies water during dry months. To educate students on best practices in the field, leading scientists and instructors shared their insight during the three-day program. Morning lectures were followed by field demos on how to use different tools, including a magnaprobe to measure snow depth across a transect and an infrared camera to look at the temperature of snow at different layers. CEE graduate student Steven Pestana uses a magnaprobe to measure snow depth across a study area. Afternoons were spent in small groups, taking measurements with the newly learned tools and processing data. In the evenings, groups presented their results and discussed findings and observations. “The focus wasn't on the data collected necessarily, but on being considerate of how the measurements were taken, what they represented and how they would be used to address future research questions,” Victoria said. The snow school culminated with group projects, enabling the students to practice applying the new tools and concepts they learned. “The group I was in centered our question around a hypothetical situation, where a satellite had flown over the study area and we wanted to collect in situ (ground) data to validate the satellite data. We collected data on snow depth, snow density and snow water equivalent in a small field site,” Victoria said. In addition to becoming more skilled at hands-on snow measurement practices, the students also took away an appreciation for gathering data in the field, which is often used to verify data collected by other means, such as satellites. 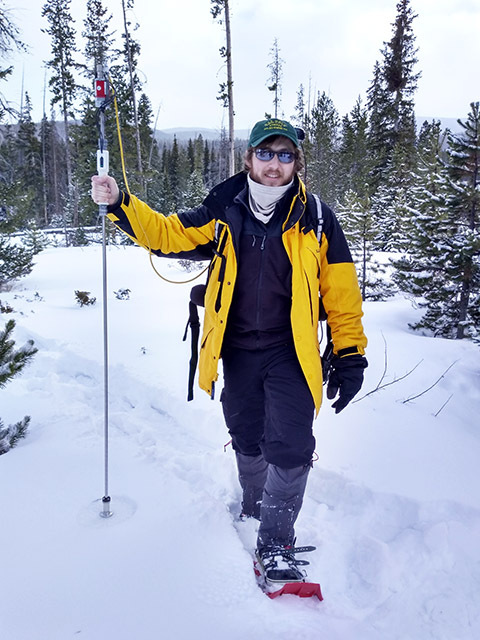 “With my research interests in remote sensing of snow, I have a greater appreciation for the data collected on the ground, which is used to inform or calibrate remote sensing observations and hydrology models, and for the wealth of information that can be learned by simply digging a snow pit and studying the snow’s layers, crystal structures, textures and density,” Steven said. Learn about the upcoming snow school, planned for January 2019.